I FIRST MET Hare Krsna devotees in the winter of 1971. I was a sophomore (second-year student) at Colorado State University in Fort Collins, Colorado, about sixty-five miles north of Denver. I saw four or five devotees with shaven heads and saffron robes chanting in front of the Student Union building. "Wow!" I thought. "What next?" I started walking the other way, when suddenly I was face to face with one of "them." Smiling, he held out a magazine. "No, thank you," I said quickly. "At least take one of these," he said, as he handed me a small card. I looked at it and back at him, noticing the white vertical marking on his forehead. I took the card and walked away. I couldn't pronounce the strange words on the card: Hare Krsna, Hare Krsna, Krsna Krsna, Hare Hare/ Hare Rama, Hare Rama, Rama Rama, Hare Hare. Then I noticed that the card was an invitation to visit their center in Denver. Uninterested, I tucked the card away and forgot about it. My next contact with Krsna consciousness came two years later. I had dropped out of school to travel, and having run out of money, I got a job at a newspaper in Boulder, Colorado. A friend of mine had a son my age who had been reading Bhagavad-gita and wanted to join the Krsna consciousness movement. As a concerned mother, my friend kept asking me to try talking sense into her son so that he would give up "this nonsense" about becoming a devotee. One day I was at my friend's home and her son was there, explaining the philosophy of Krsna consciousness. I had no idea what he was talking about, but he sounded sincere, so I listened. Then he asked me to listen to an album he'd just bought, called The Radha Krsna Temple. I'll never forget the feeling that overtook me as I sat there. I got goose bumps, and tears welled up in my eyes. It was the most beautiful music I'd ever heard. I thought, "This is not of this world!" I soon visited the temple in Denver, where I saw the film The Hare Krsna People. The devotees' kindness impressed me, and when a devotee sat down with me and answered all my philosophical questions with references from the Bhagavad-gita, I was convinced. Although I had been reading the Gita, I couldn't explain what it said. When the devotee explained everything to me, it made perfect sense. Feeling confused, elated, and exhausted, I returned to my little apartment and began to face what I knew I had to do quit my job, move into the temple, and take up Krsna consciousness. The next two weeks were difficult for me, as I told my friends and family about my desire to be a devotee. My parents thought I'd been drugged; my boyfriend thought this was a passing fad I'd get over. But I didn't. I arrived at the temple door about three weeks from the day I'd heard The Radha Krishna Temple album. I had only my car, my sewing machine, and one box of personal belongings. That was more than twenty years ago, and never for a moment have I regretted the decision to move in and become one of "them." Nataka Candrika Devi Dasi has been teaching in ISKCON pre-schools and elementary schools for the last twenty-one years. 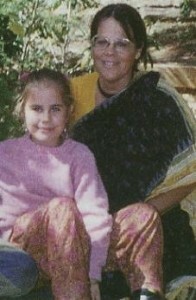 She lives in Alachua, Florida, USA, with her husband, Radha-Damodara Dasa, and their three children.